Stop what you are doing. Go to the store and buy bananas and let them go super ripe. Okay, all set? Let's continue. These. are. the. best. muffins. EVER. Overripe bananas, cocoa powder, and greek yogurt come together in this muffin to create the moistest, fluffiest muffin you've ever tasted. The scent of banana combined with the richness of chocolate is intoxicating. I was nonchalantly walking from my kitchen back to Mad Men after topping a still warm muffin with a little yogurt and had to stop in my tracks. That good. I used a recipe from Tyler Florence, my first chef crush, and changed 1/4 cup of flour with natural cocoa powder. In order to account for the cocoa powder, I had to add more moisture by way of greek yogurt and baking powder since baking soda does not leaven cocoa powder. A topper of cinnamon and honey flavored greek yogurt lends this chocolate confection to breakfast. I think I have about 5 posts on the back burner (har har) but this jumped to the front of the line. So go, go make these and enjoy them as much as I did! First, preheat the oven to 350 F. Sift or whisk together the dry ingredients: flour, cocoa powder, baking soda, baking powder, and salt. With an electric mixer whip the four bananas and the sugar for 3-5 minutes, until the mixture is lighter in color and fluffy. Add the yogurt, eggs, vanilla, and cooled melted butter. Be sure to scrape down the side of the bowl. Add the dry ingredients to the wet in 2 batches, folding in gently until combined with a spatula. Fill lined muffin tins 3/4 of the way full with the chocolate banana batter. Bake for 22-25 minutes at 350 F until a toothpick comes out clean. Let cool for at least 10 minutes. While cooling, mix together all of the the ingredients for the yogurt topping. 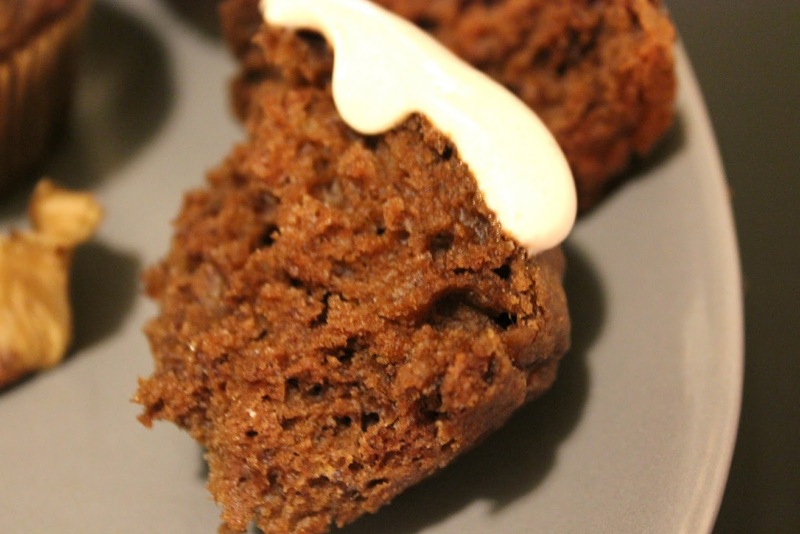 Add a dollop of the yogurt topping to the chocolate banana muffins and enjoy!